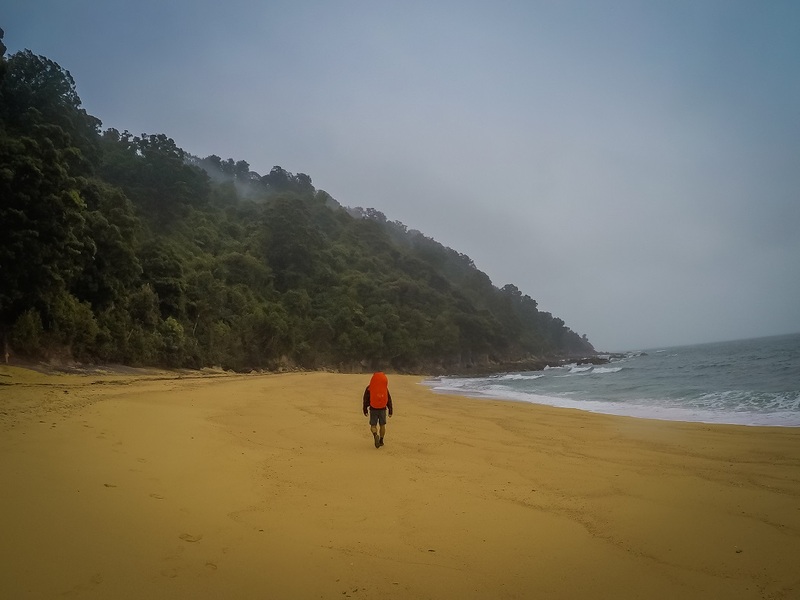 The Abel Tasman track is an easy walk through coastal forest with several beaches and coves within the Abel Tasman National Park. The region looks more tropical than any other place in New Zealand, however this track had us wanting more. During the peak season, this track is very popular and fully booked with hikers and day trippers. Boat trips shuttle up and down the coast offering the ability to customize a trip. If tramping, don’t be surprised 30 km into the track to find families wearing flip flops and touting rolling suitcases. Preferring more solitude during a multi-day walk, this was not our favorite track in New Zealand. We feel the best way to explore the beautiful coastline is on a kayak, a more unique experience than the walk itself. Located on the South Island, Abel Tasman is a tropical setting unique to New Zealand. What looks more like the Caribbean or the South Pacific, Abel Tasman is easily reached from Picton (2 hours) or Nelson (one hour). Abel Tasman is located between the towns of Marahau and Wainui Bay, both of which are the access points into the national park. 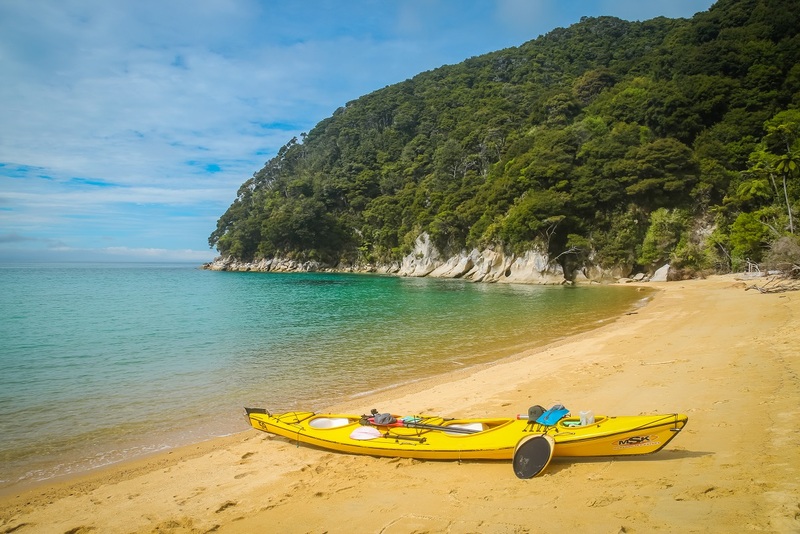 Most businesses catering to day trips (kayaks and boat tours) originate from Marahau. 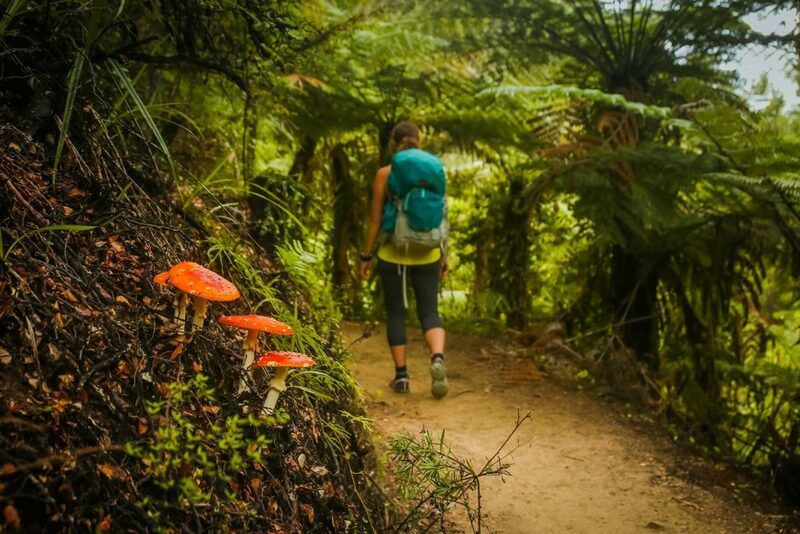 The Abel Tasman track is a year-round track. Huts and campsites require prior bookings. Huts have cooking stoves and a resident hut warden. Campsites have a cooking shelter and sinks. This track has a very busy summer season, making the winter and spring a great time to visit. We recommend a three-day hike, but for a more relaxed pace, four days is also an option. The main huts to stop at are Anchorage Hut, Torrent Bay Hut and Awaroa Hut. There is camping available at these huts as well as several other locations. It is important to know tidal times (see Tide Tables) as there is a bay crossing which can only be done during low tide at Awaroa. 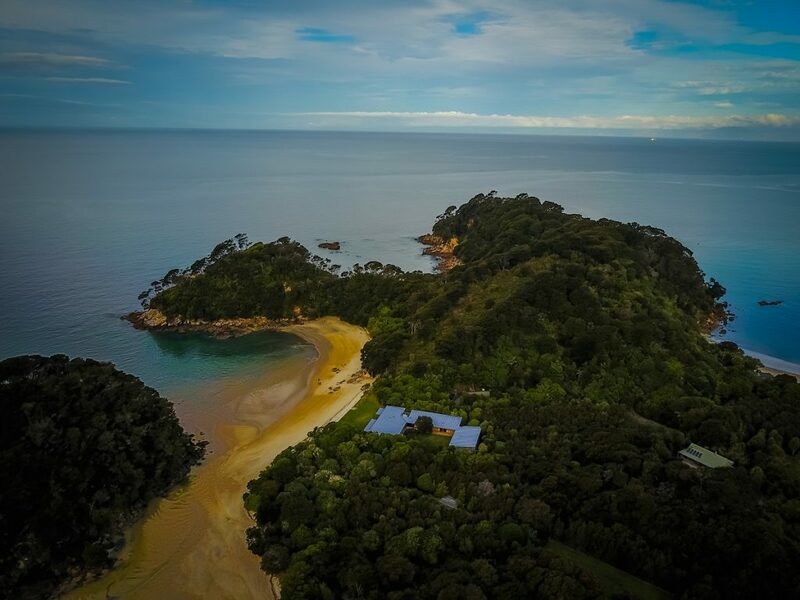 For more isolated campsites, check out Te Pukatea and Mutton Cove. For more details on hut locations, distances and maps, check out the DOC website for the Abel Tasman Coastal Track. Huts and tent camping must be booked prior to the walk. Huts can book out far in advance during the peak summer season. Currently, campsites cost $15 pp and huts cost $32 pp; however, there in an increase on the cost of the huts beginning on October 1, 2017 to $38 pp. Book online for campsites and huts at the DOC’s website. The hike starts in Marahau and ends at Wainui Bay. It is possible to have free transportation with two vehicles, one left at both ends or to switch keys with someone walking the opposite direction. The drive in to Wainui Bay is on unpaved road which may require 4wd depending on conditions. It is also possible to hitchhike from Takaka. However, the easiest way, is to book transportation with one of the several boat companies. Boats depart from Totaranui and return to Marahau. The cost for a water taxi is $47. Several companies are available, with four boat transfer per day. The walk begins from Marahau on an inland track that has a couple coastal viewpoints. The trail is mostly flat and very busy in the section between Marahau and Anchorage. The scenery continues to get better the further you get from Marahau. There is one larger ascent up a bluff before Bark Bay. The campsite at Bark Bay is a nice location just on the beach. From Bark Bay the trail is mostly flat to Awaroa, with one bluff at the end to climb. Awaroa campsite is quite small and not the most scenic, however, due to the tides and necessity to cross Awaroa Bay during low tide, this is a common place to stop for the evening. Cross the bay during low tide only (max two hours on each side). At low tide, water was just below the knees. The trail to the end at Totaranui crosses several beaches and has a true coastal walk feel. During our last day we had a downpour so we ended our hike a short distance from Awaroa. 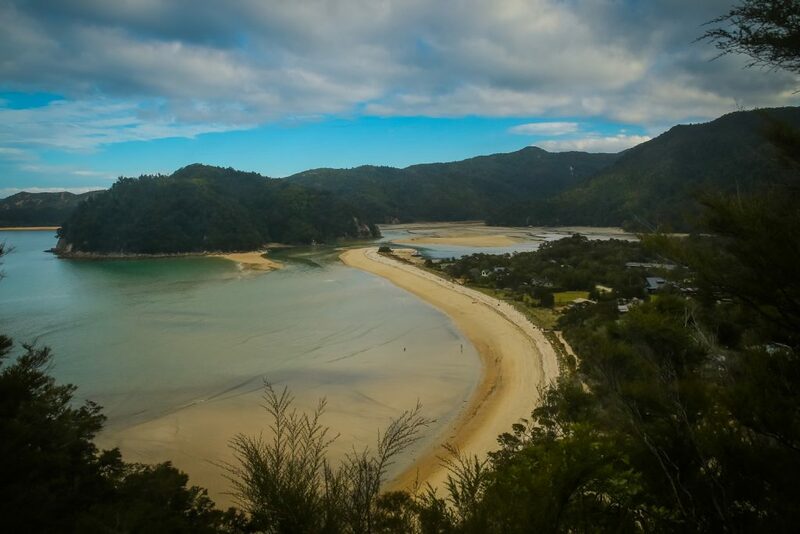 It is possible to finish the full hike and loop back to Toaranui using the Abel Tasman Inland Track. Multi-day Rental: $100 for 2 days, $162 2 days and water taxi, $145 3-day rental, $167 3 day kayak and walk rental. Starting at Marahau, hike for the day to Anchorage and back for a full 8-hour day. However, for only one day, we recommend kayaking. Either rent a kayak for the full day, or book the kayak/hike option to kayak to Anchorage and hike back to Marahau. 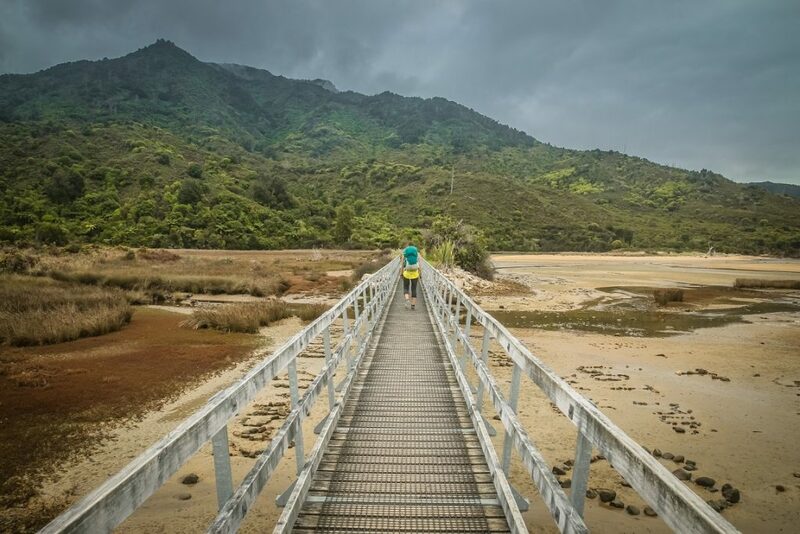 This hike requires a bay crossing at Awaroa that is only possible at low tide. There are also several other bays/estuary’s (Torrent Bay, Bark Bay, Totaranui, and Mutton Cove) which are possible to cross at low tide and cut distance/time from the trail. It is important to know the crossing times at Awaroa, and only attempt to cross two hours on either side of low tide. 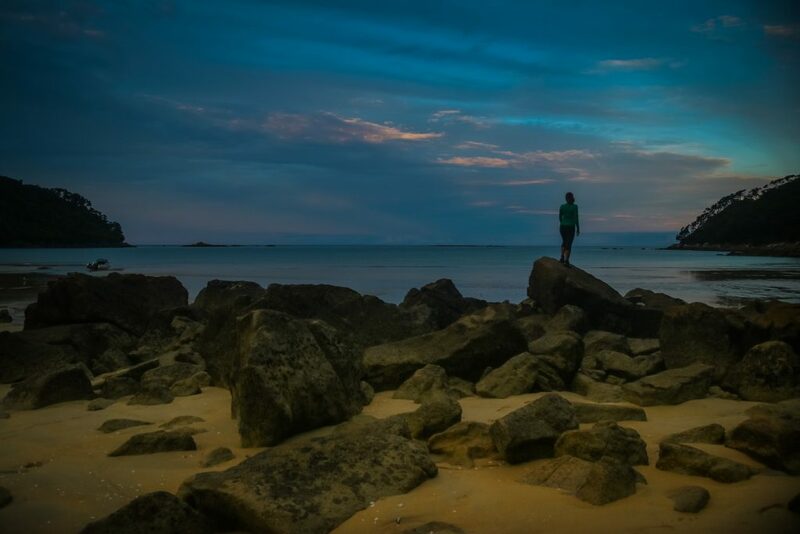 Click here for tide tables in Abel Tasman. Tide crossings are posted at Anchorage, Torrent Bay, Bark Bay, and Totaranui. If you do not have the information prior to the hike, make sure to check one of these locations for the latest tide information. During the summer expect high traffic on the track, and several campsites/huts have the possibility to be fully booked. Booking transportation during peak season in advance is advised but not required. There are phones for use at Totaranui to contact the boat shuttles for pickup times and to see which is available.